A good dungeon crawler is hard to find these days, and bedroom programmers seem to be the only ones making them. Developer System Prisma decided to meet them halfway with ClaDun X2. It's an action-RPG that is part Roguelike and part RPG Maker, offering enough customization options to keep players entertained within its miniature world. 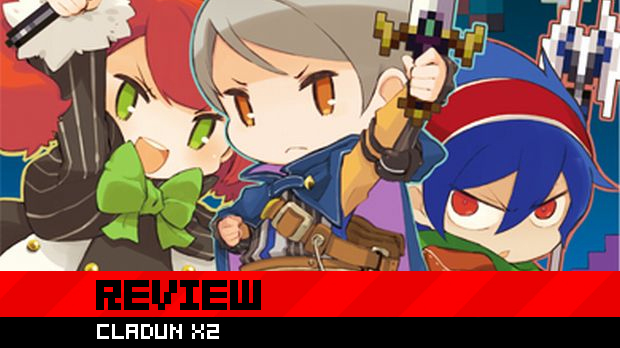 With complex leveling systems, intuitive combat and procedurally generated dungeons that can last a day to explore, ClaDun X2 is an oddball release for a diminishing audience. However, it’s one worth seeking out if you fancy an old-fashioned dungeon crawl. If you are still reading this review, then it’s safe to assume that you own a PSP and enjoy the quirky, modestly-sized RPGs that publisher NIS has been putting out for the system over the years (Prinny, What Did I Do to Deserve This, My Lord! ?, Z.H.P.). In other words, this review is for the two of you. 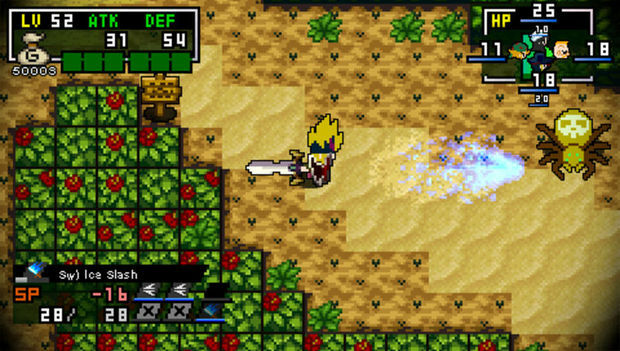 As with the original, ClaDun X2 throws you into a world of dungeons, item shops and townsfolk with single-sentence responses. Arcanus Cella’s modest size and economic layout (every location has a purpose) is inductive of the adventure to come. After creating your character and class of choice, you enter your first series of dungeons that act as a tutorial to the game’s unique design. Each dungeon has the primary goal of reaching its exit with a secondary time-based goal -- get to the exit within the designated time and you’ll acquire “fame” which unlocks bonuses within the town hub. Although there are a couple floors you’ll be able to race through on your first try, most require significant knowledge of the dungeon’s layout and well-leveled characters. Dedicating yourself to beating all the trials can be a daunting task in itself. Racing through the dungeons lends the game a unique feel akin to Half-Minute Hero, but generally speaking, you’ll be taking your time. As you should, since the dungeons are full of traps. You can only see these traps faintly, as you approach them. Since these deal out mostly projectiles, you can use them to your advantage: step on an arrow trap and let it hit an enemy, dealing out significant damage. However, be wary that the same is true of the healing traps, which you will rely heavily on throughout the dungeons. Each dungeon is made up of four floors. The final floor usually culminates with a boss battle and a brief cutscene that progresses the story. The story is paper-thin but the dialogue in these scenes is charming in the way you expect of an NIS title. It’s mostly cutesy, meta-JRPG dialogue that pokes fun at tropes. You either are into or not, but skipping all of it is an option and one the game won’t punish you for. It’s a pretty straight-forward game but you’ll still need to dedicate some time to understanding the combat and character systems. 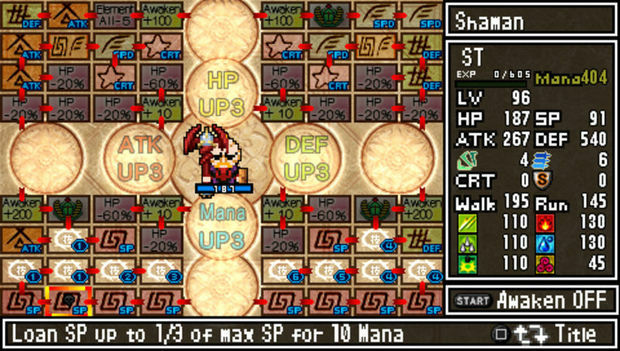 What keeps the ClaDun X2 interesting through the constant grind of dungeons is the Magic Circle system that dictates your party formations and character progression. At any time in the game, you can create new characters. 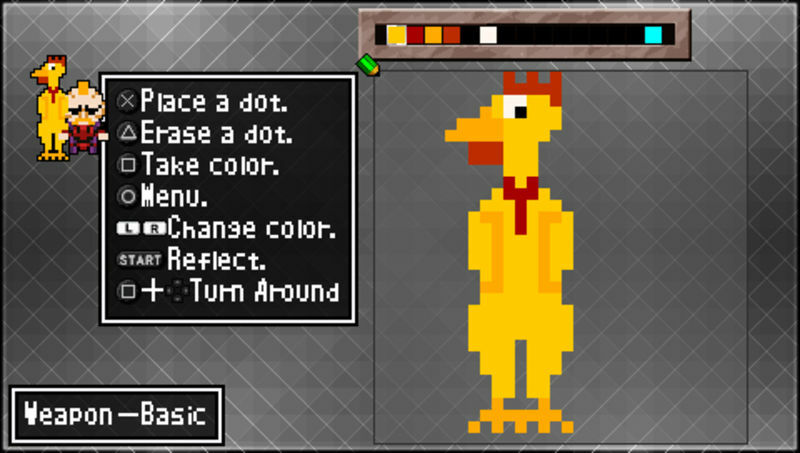 The options are very limited but you can always create your own pixel art if you are tired of your party members looking too much alike. The important customization features come with creating a diverse party and giving them important roles within your magic circle formation. Each class has their own magic circles they unlock, which dictates all their stats, abilities and experience points. Every circle favors a certain type of play style: do you want to level your Ranger, or give your Warrior brute force for a boss encounter? The details in these setups are important, as sub-characters' position on a grid will dictate all your buffs and health bonuses. If they die, you lose it all. Properly building these formations can be time consuming, but you can thankfully save them and swap them out before each dungeon. A couple hours into ClaDun X2, you’ll unlock access to the game’s procedurally generated dungeons which are designed to challenge and steal hours of your life away from you. Along with the 99 floor neo-geons of the first game, the sequel adds in tri-geons which make random floors really easy (with great loot) or really hard. You can easily become obsessed with reaching the end of these and completely forget about the game’s main campaign and the time trials. The combination of all three gives the game a surprising amount of variety, all things considered. Along with these endless dungeons, you have an endless amount of characters, music and equipment to play with due to all the editing tools within the game. It’s a shame that NIS didn’t implement better sharing features. Sure you can find message boards filled with people sharing saved edits via file sharing services, but that’s hardly convenient. The game’s offerings seem a bit bare without these additions. As with the original, you can switch between an orchestral soundtrack and retro 8-bit version on the fly, but you’ll find the limited selection of tunes grating after a while. 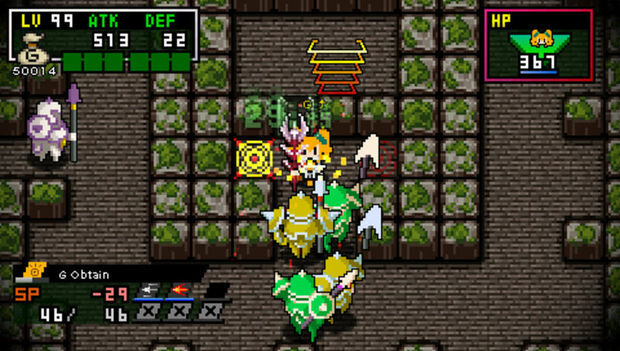 ClaDun X2’s combat and world feel a bit generic and small in comparison to Quartet’s masterful SNES titles and similar action-RPGs, but the customization, Magic Circle system and endless dungeons make ClaDun X2 a recommendable title for RPG-lovin’ PSP owners. 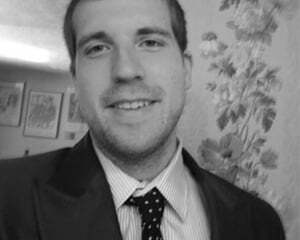 With such small goals, there can only be a faint amount of praise to compliment the game. It’s good, it works, and it’s on a system that I rarely find an excuse to power on anymore. The fact that I kept my system dust-free for a week because of ClaDun X2 is an accomplishment in and of itself. Now, I’d just like to see a console sequel with improved combat and the production values of 3D Dot Game Heroes.